Red Kings’ initial software download is only 1.13mb in size. The installation file can be downloaded in a of couple seconds, although the bulk of the software is downloaded later on during its installation. With a standard cable or DSL modem you should have the software downloaded and installed within a few minutes. Once you’ve loaded up the client you are able to choose from an impressive 25 different languages. Red Kings is also available for Mac and Linux users. 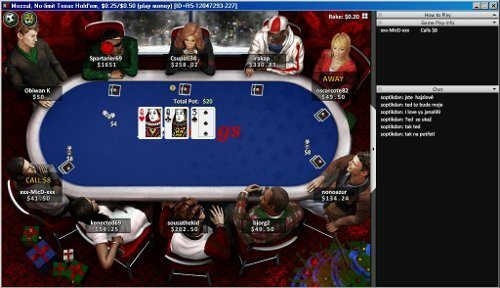 No matter the operating system or browser you use, RedKing’s poker can be played without any problems. The variety of available languages, coupled with its Mac compatibility, encourages a large amount of traffic. This download, which was developed by OnGame, is continually updated and improved. It incorporates great features that give you the choice of how you play their games. Players from all around the world come to RedKing’s Poker for its ease of use and fantastic graphics. Another notable feature of RedKing’s Poker is their non-download version. Whether you’re not at home, at work, or traveling the world, you can play their Java based version without ever having to download anything on another computer. The OnGame software platform is well respected and trusted by thousands of players everyday. Sun Microsystem’s SecureRandom function for Java ensures that the cards are random, and the software employs a top notch encryption to keep all users’ data safe and secure. Overall RedKings is a sound software package with great features, graphics and traffic, all while remaining safe and secure! RedKings has an extremely sharp and smooth interface, as their software is just awesome. When playing on Red Kings, you’re given a few options on how to navigate throughout their site. 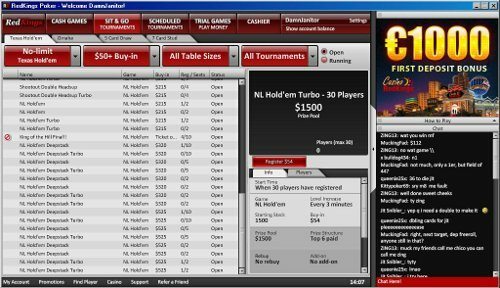 You can use the quick seat option, in which you can choose between cash games or SNG’s for your game type. Then, you choose No Limit, Fixed Limit, or Pot Limit for your limit. Then, under your third option, stakes will appear. It’s a really cool function that allows you to get to where you want to go with no fuss. However, if that doesn’t work for you, then using the tabs to navigate is the way to go. Either way, you won’t be disappointed. Start playing at RedKing’s Poker today!